The cost of crumbling roads has hit local councils heavily, with over £43 million paid out in compensation claims to motorists and cyclists over the last five years. That figure, obtained by cycling campaign group Cycling UK, was gathered from Freedom of Information requests to 156 highway authorities. It found that the average figure paid out in compensation to motorists was £841. The figure for cyclists was much higher though – an average of £10,963. Cycling UK suggests that the higher level of compensation paid out to cyclists is more likely to include personal injury claims rather than simply property damage. Local authorities on average incurred costs of £277,707, and claims were accepted from 30,893 drivers and 670 cyclists. Cycling UK thinks the actual figures for injured cyclists are much higher, though. 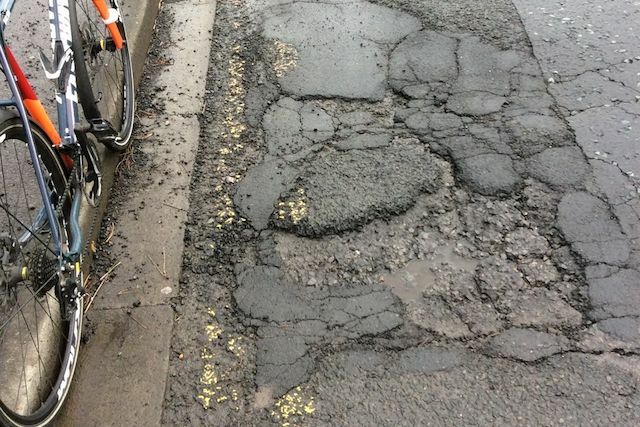 In a survey of 5,000 cyclists the group conducted alongside BBC Radio 5 Live and Cycling Weekly, it found only 36 per cent of cyclists injured in incidents with potholes actually alerted the council. The most common issue was that the complaint form was too difficult. The survey found 54 per cent of those injured described themselves as 'slightly injured' and eight per cent as 'seriously injured'. Six hundred of the 5,000 respondents had to take time off work as a result of their injury and most worryingly – according to Cycling UK – 31 per cent were put off from cycling as a result of pothole related incidents. Sam Jones, Cycling UK's senior campaigns officer said: "Cycling UK's research reveals only a glimpse of pothole Britain's human cost. It's clear more people are being killed and seriously injured while out cycling each year due to years of persistent under investment in our rotting local road networks. "The Government should concentrate on fixing the roads we have first before building new ones. Councils need provide enough funding to adopt long-term plans for roads maintenance, rather than pursuing a policy of patching up streets only as they become dangerous. "With the Government looking to encourage more and safer cycling, then the UK's road surfaces need to be safe enough for people to cycle on."